Ever wonder how to wear white with panache and not look like Colonel Sanders? White clothing was born of necessity, particularly in warmer clients. It has a light bouncing reflective quality and just doesn’t hold in heat as much as darker fabrics. In addition, white suiting has been viewed as a signal of status, as it is the hardest to keep clean, and utilized by the affluent. You can employ white this summer purely for pleasure and style, but there are guidelines to follow to use this great summer classic and know that your look is on target. What to avoid: White shoes, grey slacks, white belt. Yikes! This geriatric Floridian combo is wrong on so many levels. Yes, matching a black, brown, or tan belt to the shoe is a great idea but NOT with colors that are not neutrals. There is white and there is WHITE. Consider breaking yourself in to this cool summer color with just the lowercase version. More specifically cream, ivory and bone are great light summer colors that don’t have quite the starkness of white. White or light colored suits DO have a season in New England and certainly north of the Mason Dixon line. It’s Memorial Day (weekend) to Labor Day. After that, you can still utilize your suit as separates, such as the jacket over jeans, or the trousers with a great sport shirt. This is how GQ dresses up a white suit for a summer wedding – note the dark shoes and belt give solidity to the outfit with the strong colored shirt. And can you see that it wouldn’t be the same with out the pocket square? Cream and tan bucks are a must have in your summer closet. The tans are the more subtle style option, although they ROCK a navy cotton suit, or jeans. The white ones are indispensable if you wear white, or seersucker. There are two schools of thought on keeping the white ones clean… do or don’t! Suggestion: own two pairs – one for more formal events that you attempt to keep clean, and one that you love to throw on with shorts and they keep getting better as they get dirtier. 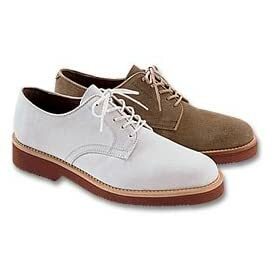 A white leather shoe like this gentleman below (ankle bracelet optional!) can be nice if employed judiciously, and on whimsical cotton candy plaid kind of days. How ever you choose to wear white this summer, come out of the box and get some on! It’s cool, light and bright and it will look great as you sip a mint julep or playing croquet on a sunny day. It might even inspire you to take a trip to Block! Want to know how to make wearing white work for you this summer?